Home » Crime » The Guillotine: Does death by decapitation equal instant death? The Guillotine: Does death by decapitation equal instant death? The prototype design of the guillotine is attributed to the French doctor Antoine Louis, who came up with the idea during the French Revolution. For a period of time his invention was called louisette, which was later changed to guillotine in order to commemorate Joseph Ignace Guillotin, an advocate of a more humane method of capital punishment. The invention of the guillotine was dictated most of all by changing sensibilities within late eighteenth-century society as well as growing egalitarian attitudes ignited by the French Revolution. Unlike other methods of execution, as for example the breaking wheel designed specifically to inflict pain, the guillotine was perceived as a more humane way to end people’s life, and was used equally on all the condemned regardless of their class or status. Up to that moment, members of the nobility were beheaded with a sword or axe, while commoners were usually hanged. Decapitation by guillotine brought not only equality, but in actual fact, it extended the ‘privilege’ of noble death to those of a lower social rank. The first execution by guillotine was performed on highwayman Nicolas Jacques Pelletier on the 25th of April 1792. The total number of people killed by this device stretches somewhere between twenty and forty thousand. 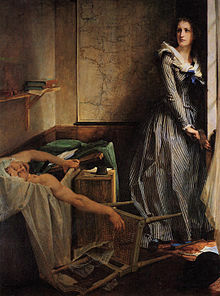 Charlotte Corday by Paul Jacques Aimé Baudry, posthumous (1860). One of the most interesting cases of death by guillotine is that of Charlotte Corday d’Armont, condemned to death for assassination of the radical Jacobin, Jean-Paul Marat (the scene of the murder was later depicted in Jacques-Louis David’s painting The Death of Marat (1793)). Corday d’Armont was executed on the 17th of July 1793, four days after the assassination. Her execution posed questions about the initially assumed immediacy of death by guillotine. “A story was immediately spread around that when the executioner held up her head to the crowd, and slapped one of her cheeks in retribution for her deed, she visibly showed her indignation. … The implication of this account of her last minutes was clear; death was not immediate upon decapitation, for the head was capable of movements: grinding of teeth, convulsions, movements of lips and eyes. These suggested the continued presence in the head of something which could be described, according to preference, as a soul, will, mind or self. It seemed to many observers that such signs were unambiguous expressions of conscious exertions on the part of the guillotine’s victims, prompting the idea that pre-arranged signals between those sentenced to death and their friends would prove the issue one way or the other. Those who maintained that consciousness persisted after decapitation further argued that death was not painless, but, on the contrary, that the sensations produced by decapitation were exceedingly vivid. Consciousness could therefore continue, they believed, despite such drastic bodily mutilation.” (Ludmilla Jordanova, Medical Meditations: Mind, Body and the Guillotine, History Workshop, No. 28, Autumn 1989). This event sparked a heated public discussion, questioning the forethought humane aspect of decapitation by guillotine. Various physiological reactions of numerous decapitated bodies straight after execution suggested that there was a possibility that this form of death was not free from pain at all. Whilst there had been medical records on those who had revived after hanging or who had nearly drowned, describing the sensations they had experienced as being like those of falling asleep, similar testimonies from those who had been beheaded were simply impossible to obtain. Soon, two opposite groups of medical mediators emerged : those who “argued that conscious life persisted after the separation of head from body, making victims suffer in a manner which was medically, morally and politically unacceptable”, and those who “claimed that death by guillotine was instantaneous and painless” (Jordanova). It seems that their medical opinions were entwined with their moral as well as political views: “Those who claimed that its victims suffered, could easily use this as a basis for accusations of barbarity against the republic. Those who saw no evidence of suffering, were, in fact, more sympathetic to a moderate revolutionary position” (Jordanova). The issue also posed various moral and philosophical dilemmas, the main one, chiefly concerned with the existence (or nonexistence) of the relationship between body and mind. A thought-provoking article about the efficacy and morality of the guillotine. I had no idea that people were still being guillotined in 20th century France. The last was as late as 1977. This has always interested me, in a morbid way. I think the general medical consensus is you’ll definitely be still with it a few seconds after you lose your head. Which is an eerie thought. I read Dr. Frances Larson’s book Severed: A History of Heads Lost and Heads Found for this and I can recommend it to anyone interested on the subject. uuu, that is indeed spooky!